Taxation via inflation “does not require detailed legislation, and can be administered very simply. All that it requires is to spend newly created notes. The resulting inflation automatically imposes a tax on cash balances by depreciating the value of money”. Philip Cagan said this in a pioneering 1956 study of hyperinflations worldwide. Britain’s Hugh Dalton observed how government deficits could be met by “use of the printing press to manufacture legal tender paper money” to pay government creditors either directly “with new paper money specially printed for the purpose” or indirectly “out of loans to itself from the Central Bank”. 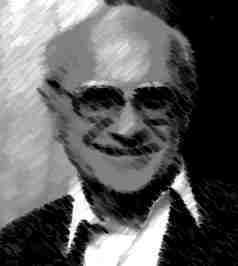 Milton Friedman and Anna Schwartz pointed to America’s wartime resort to inflation. Government debt held by a central bank quickly filters through to appear as an asset in balance-sheets of commercial banks, causing expansion of bank-lending and hence of bank-deposits and broad money. After the attack on Pearl Harbour, the US Treasury could get from the Federal Reserve or commercial banks “any funds that it needed beyond those secured by taxation and by borrowing from non-bank sources”. America’s wartime banking system became “a mechanism for providing funds to finance government expenditure” — deposits grew because “bank buying of government securities increases bank deposits”. In RF Harrod’s words: “There is a well-known aphorism that ‘bank loans create deposits’…. if the central bank has an increase of assets, whether through a gold inflow or its own increase of ‘lending’ (including the purchase of bills or bonds), some commercial bank will have an increase of assets of equal amount, in the form of claims on the central bank (deposits at it or notes issued by it) and an increase of deposit liabilities of equal amount to its customers”. India has followed in peacetime over six decades what the USA and Britain followed during war. Our vast growth of bank-deposits in recent decades has been mostly a paper (or nominal) phenomenon caused by unlimited deficit-finance in a fractional reserve banking system. Policy-makers have widely misinterpreted it as indicating a real phenomenon of incredibly high savings behaviour. In an inflationary environment, people save their wealth less as paper deposits than as real assets like land, cattle, buildings, machinery, food-stocks, jewellery etc. Almost 50% of annual public revenues in real terms may have been arising from inflationary finance in recent decades. To take a specific example, during Dr Manmohan Singh’s tenure as Finance Minister, Union Government expenditure net of operational income was some Rs. 1.3 trillion (Rs 1.3 lakh crore) in 1994-1995. Some Rs. 675 billion (1 bn= 100 crore) was raised from all taxation that year, Rs 183 billion from direct taxes. The remaining Rs. 620.8 billion was borrowed on behalf of future generations of citizens using the Government of India’s credit. What is termed “Gross Fiscal Deficit” is this additional or marginal annual borrowing — it adds itself to the ongoing stock of public debt every year and has been continually monetised insofar as our mostly nationalized banking system annually comes to hold government securities to that additional amount. India’s inflation-history shows a first phase from the 1870s until the Second World War when money prices fluctuated in response to real shocks, positive and negative, domestic and international. E.g., the US Civil War and First World War caused demand surges for Indian manufactures like cotton textiles and steel railway-tracks, while the Great Depression saw Indian prices crashing with world prices. During the Second World War, money prices in India rose at their fastest rate ever, caused by deliberate British policy to pay for war expenditure by printing money. The British resort to inflationary wartime finance saw the highest money supply growth rates in India ever to occur to date. 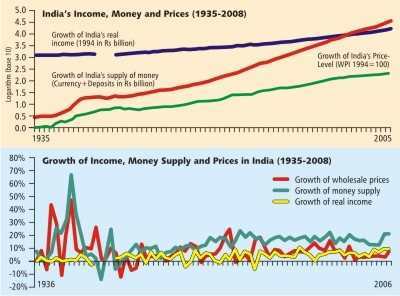 This pattern came to be adopted and institutionalised by independent India’s socialist authorities, so there has been a third phase of steady inflationary finance from the 1950s until today, along with negative shocks like military and civil conflicts, droughts and oil price-rises, as well as happier developments like technological progress leading to growth of real income (see graph). Two more relics from the wartime British Raj continue to dominate Indian macroeconomic policy to this day. One is unlimited spending on vast standing armies — our supposed adversary itself being a political remnant of the Raj with similar macroeconomic problems to ourselves. India’s army has some 19 divisions facing Pakistan, Pakistan’s army has 19 divisions facing India! The other relic has been the Indian rupee becoming inconvertible as a world money ever since import quotas were imposed across the Sterling Area in 1940-1942. Lack of convertibility has made all government finance in India unlike that in modern Western economies. US government bonds are held freely in foreign portfolios so a Swiss household or Japanese bank may trade these as they please. Bond prices vary inversely with interest-rates, and yield curves would be attempted to be defined reflecting the maturity-structure and state of expectations. Competitive arbitrage in international capital markets may succeed in ensuring government debt is priced accurately. A central bank with a convertible currency sells debt to raise monetary interest rates and attract capital flows, buys up its debt to lower rates and cause capital outflows. Money growth unwarranted by real growth depreciates the currency under floating exchange rates; a partial export of inflation occurs under fixed-rates. Debt instruments are liquid near-moneys, and it is because US Government debt has been liquid that debt instruments of its sub-sovereign divisions like States or municipalities are almost as liquid. If sovereign debt is not liquid, nor will be sub-sovereign debt. In India, bank assets may be liquid domestically but are illiquid internationally. Government debt is not held by domestic households as voluntary savings nor has it been a liquid asset held worldwide in foreign portfolios. The same holds *a fortiori* for debt issued by more than two dozen State Governments. “Mutual funds” created in recent years do contain government debt on modern principles of portfolio-selection but amounts involved are small. The Rupee achieving monetary integrity after more than six decades of governmental misuse would be indicated only when any ordinary Indian resident can freely hold or trade India’s money for foreign moneys or precious metals as he/she pleases. India’s economy and money can begin to move towards coherence and integrity only when we put to rest the three relics from the wartime British Raj which we unthinkingly have allowed to dominate our macroeconomic policy-making ever since.